*Hunter Douglas Authorized Dealer* Custom Closets in Chicago and Chicagoland is our specialty for over 30 years (since 1986). Experienced Designers enhance your personal organized spaces including Closets, Offices, Garages, Pantry, Laundry or Wall Beds. Our designers have an average of 14 years of experience and come out to your home for a complimentary in-home design consultation. Our storage systems are custom manufactured under strict quality standards in our 60,000 sq. ft. factory in Elmhurst, IL. Our Chicago showroom at 2112 N. Clybourn Ave. showcases many examples of our custom designed systems to get organized in your space. Free No Obligation In-Home Consultation! Closet Organizing Systems is a manufacturer of custom-designed closet and cabinetry storage systems for residential and commercial applications. We make a variety of closet systems, locker systems, book shelving, built-in style casework, garage storage cabinetry, custom offices spaces, and entertainment centers. We manufacture and install our products using a variety of melamine, plastic laminate, domestic and exotic wood veneers species. We also offer products made from environmentally-friendly materials that are EPP-Certified. We utilize CAD cabinetry software technology to design and release our manufactured parts and component parts directly to our CNC controlled wood working machinery. We are dedicated to providing our customers with the highest quality workmanship, superior materials, and personalized service on every project. Whatever your closet organization and storage needs, we have the closet system that will work for you, manufacturing, designing, and installing custom closets in the Chicago area. 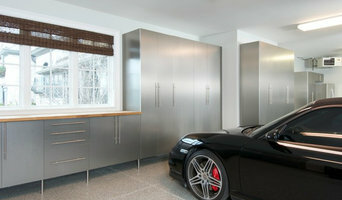 EncoreGarage specializes in transforming residential garages into clean, organized and functional space. Our services include premium Polyaspartic/Polyurea floor coatings, high-end "Garage-Grade" cabinetry and innovative ceiling and wall organizer systems. With EncoreGarage you will get a well-established company built on the principles of customer service, creativity and value. We offer a highly professional approach and promise you friendly knowledgeable service with an emphasis on integrity from the first phone call through the final installation. We employ clean cut, well trained installers and utilize top notch products that have been thoroughly tested through years of rigorous installation. We stand behind our products and our staff is always available should any question arise, or should you encounter service issues down the road. Since 2004 we have perfected the art of garage makeover and have completed thousands of projects for homeowners all over the Chicago Metro area. Carson Closets & Cabinetry is excited to announce the launch of our new brand INSPIRED CLOSETS. Same great service and quality you expect with a new and enhanced product line. At INSPIRED CLOSETS we design peace of mind for all areas of your home. From the closets to the garage to the home office, our experienced designers can create the perfect solution that will increase your space, make things more functional and accessible, and at the same time incorporate aesthetically pleasing and long lasting materials. Our commitment is to enhance the quality of your life as well as the value of your home. This is accomplished by not only outstanding products, but by the unique ORG Home Experience. From the first phone call to the final installation, we are dedicated to making the experience enjoyable, and the results remarkable. Chicagoland Home Products specializes in custom storage solutions and window coverings, bringing you over 25 years of design, engineering and installation experience. At Chicagoland Home Products we believe in using our extensive experience to offer the most elite products, share in-depth product knowledge and complete the job with the most professional installation service. We provide the highest-quality custom closets, storage solutions & window coverings. Biz owner, wife, mama, and jokester. Born in Poland and raised in Chicago. Love the city but my heart has found its perfect peace in our semi-rural suburb where I’m so lucky to call home. I have lots of energy, you’ll know what I mean when I start talking – fast, super fast talker. I love to cook amazing food every day, crafty beaver is my middle name, iced black coffee is where it’s at, reading over TV any day, clean house or else, and everything organized. I have a super cool husband that takes great care of us, three awesome kids that make being a parent the best thing ever, and a Goldendoodle named Pippi that seals the deal. Some of our best times are weekends at our lake house where it’s just the 17 of us – I’m one of five plus our totally on top of it all parents. We eat, drink, and laugh all day. I'm a home organizing space expert. I help people get organized and feel great about their home. I help you decide what to keep, what to toss and how to store it. Whether your master closet is overrun by clothes, you have a jam packed pantry, or your kids outshined your foyer - I can make it all functional again. Fast. Efficient. Creative. OUR PROCESS AND PRICING: OPTION #1 $65/hr. (3 hour minimum) 6 hours: $390 9 hours: $540 (save $45) 12 hours: $720 (save $60) 15 hours: $975 (save $75) *Donation haul fee: $25 OPTION #2 $75/hr. per home visit. Feeling like you no longer have the feeling? No worries, we can help! We will use $50 from the ‘you do it for you’ and apply it towards a ‘we do for you’ 3 hour session. Hello, I am an interior designer that works for Closet Works specializing in custom closets, laundry rooms, pantries, home offices, and wall beds. I work with my clients to find out their needs and design a solution that is decorative and functional for the space. Everything we do is to better your lifestyle! I can't wait to work with you to make your life more organized! At Closet Factory Chicago we understand that your custom closet should be more than just beautiful — it must also be organized, functional, flexible and space saving. That’s why before we design your closet we sit down with you and discuss your every need. We will carefully inventory your current closet and design an organizational system that offers a place for everything. Once that’s done, we will help you take cues from your home to stylize your closet so that it becomes a perfect accent to the room. Our designers are highly trained to listen and work with you to collaborate and create a completely personalized system that meets your storage, aesthetic, and investment needs. We custom cut all the parts in our local factory in Elk Grove Village, IL and then our professional and experienced installers put to life the designs in your home! We love working with all manner of professionals - builders, interior designers, decorators, general contractors, real estate agents, home re-modelers and other professionals to collaborate with regards to storage, design and installation projects throughout the home or office. We want to be your referral source for custom organization storage solutions! Closet Factory Designers, Installers, and our entire staff strive to do the best possible job, and are always sensitive to the needs and requirements of property owners, as well as mindful and respectful of the work of other contractors working on site, working as cleanly and quietly as possible, and leaving the work site in "move-in" condition! Whether you have a master bedroom walk-in closet, a kid’s reach-in closet or a luxury dressing room, we will work with you to discover your unique needs, style preferences and budgetary requirements. Everything we offer is 100% made-to-order and cut-to-spec using locally sourced materials, meaning no two designs are ever the same. We allow YOU to control the budget of your project by selecting the components, materials, and accessories that go into your finished design. Whether you have the need for organized space on a budget or desire high end closets to match the character of your home, Closet Furnishings has the solution. At Closet Furnishings, we have been designing and installing custom storage systems for nearly 2 decades, with projects including but are not limited to, closets, pantries, home offices, garages, libraries and media centers. Our furniture grade laminate systems are built to last the life of your home; are cut with computerized precision prior to delivery; available in approximately 30 colors; and with polished chrome, brushed chrome, brass or oil rubbed bronze plated steel hardware, hanging rods and accessories to enhance the beauty of your room. Our professional design services are detail oriented and committed to satisfy client desires. Produced locally and free of franchise fees, Closet Furnishings' storage systems are crafted to win your business on price as well. Call today to schedule a free design consultation! My name is Jessica Litman and I am The Organized Mama. My passions of organization, crafts and home decor can be seen on my website, Project Nursery, along with The National Association of Professional Organizers (NAPO). I was born and raised in Minnesota and currently live in Illinois. I graduated Indiana University with a degree in elementary education. After college, I taught second through fifth grade while obtaining my masters degree in special education, then I taught special education for students with multiple disabilities while I obtained a certificate as a multi-needs specialist. I was the director of special education for my school district until I decided to become a stay-at-home mom. I have helped numerous families and friends get organized while I was teaching, so I thought I would share my passion for organizing. I write a blog where I share tips, tricks, and tutorials for getting families organized. I work in people's homes to create systems to keep them organized. I am a Better Homes and Gardens pinning pro. And I have been featured in the NAPO news. Quality Custom Closets offers complete custom closets services for both residential and commercial locations. Quality Custom Closets specializes in custom finishes for your homes and commercial needs, 3d software designs, and free design consultation. There aren’t enough hours in the day. So we toss the mail on the kitchen table. We put another bill on the overflowing stack in our office inbox. We step around toys or clothes on the floor. And we promise ourselves we’ll deal with it later. >Maybe a big event happens. We must go through the home of a relative who has passed away and decide what to keep. Or we want to relocate, but need to get our home ready to sell—not to mention packing and unpacking boxes when we move. We’d like to entertain in our home and want the clutter to magically disappear. We walk into a room and feel stressed out. Fixing this can seem overwhelming… The professional organizers at Altogether Organized bring calm, order and harmony to many people in your situation. We’re here to help, not judge. When we’re done, you and your family will love your home again. And everyone will know how to keep this a comfortable place. Harmony Design is a provider of high quality cabinets and storage solutions for the garage and closet environments and epoxy resin flooring systems. We provide life time warranties for powder coated garage cabinets which are engineered to hold up in the toughest environments. Our products are made right here in the U.S.A. in South Beloit Illinois. The finishes available allow for meeting the budget of any household. Epoxy flooring systems are available to provide a cleanable high tech surface to protect your concrete floors from salt and stains. Everything Has Its Place specializes in residential and small business organizing. Tanya, the proprietor, loves helping people who feel overwhelmed by clutter. She is passionate about clearing the clutter, creating smart storage solutions and developing ways to help you STAY organized. She understands the emotional attachment to items that people may have and she will help you through the process of letting go in a non judgmental and empathetic way . Serving the entire Chicago area, Cambridge Closets offers professional design and installation services for custom closets, built in wardrobes, home offices, garages, mud rooms, entertainment areas, laundry rooms and bookcases. Our mission is to create functional and aesthetically pleasing storage spaces that will become a natural extension of your home's living space. We work closely within each client's budget to turn their desires into a reality. Each client receives a free design consultation to discuss style, organizational needs and products offered. We use top notch 3D design software to provide exact renderings of your space prior to construction. We are skilled in solving complex space and design problems and combine quality craftsmanship with cost-effective solutions. Before hiring a professional organizer, consider exactly what you need. Have you just moved into a Highland Park, IL home and have no idea where to put everything? You may want to consider an organizer who specializes in room-by-room space planning or estate organization. Perhaps you’re faced with a tiny closet and an overflowing wardrobe. In that case find a professional who focuses on closets to help you get back on track. Also consider the types of objects that need organization. Are they items like books, family photos, files or collections? You’ll want a professional organizer who has experience designing custom systems with Highland Park, IL companies that will best fit your needs. Find a professional closet and home organizer on Houzz. Narrow your search in the Professionals section on Houzz to Highland Park, IL closets and home organization.